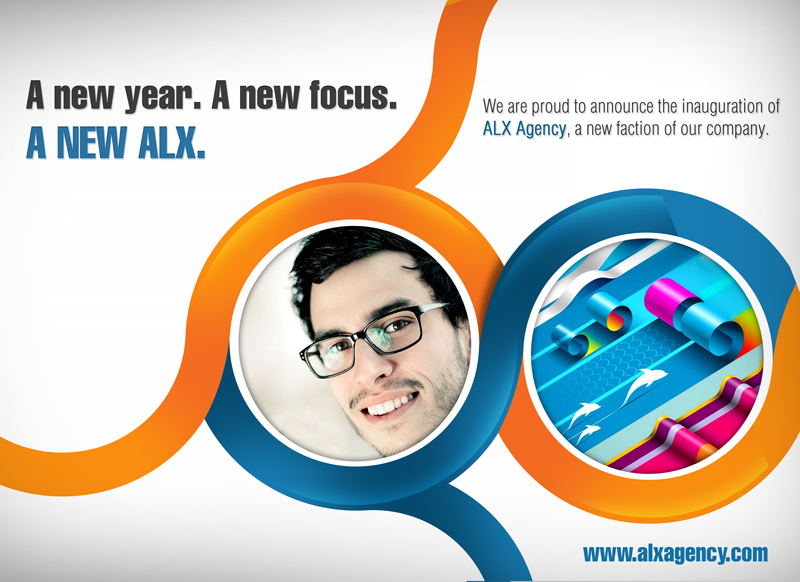 We are proud to announce the inauguration of ALX Agency, a new faction of our company. On January 1st, 2014 ALX Agency opened for business, expanding on the services previously offered by ALX Visual Communications. Alex Andrade, President of ALX, is excited to lead a new 3-tier company, which will offer new services and create new departments to tightly focus on each division. ALX Agency, the latest endeavor, was created to help small to mid-size businesses capture new audiences through creative advertising. ALX Agency will work closely with businesses trying to break into new markets. Through careful analysis and face-to-face brainstorming sessions, the agency will develop personalized marketing strategies, a beautiful visual brand, and new advertising campaigns designed to refresh and empower any business looking to grow. Starting strong with a long list of well-known local and international clients, ALX Agency is looking forward to serving the Boston community & beyond. ­­­Visit www.alxagency.com to learn more about this exciting new beginning for ALX. ALX Visual Communication Solutions, the original division, will remain open for business. However, this department will re-organize its business model to focus primarily on printing and promotional products. Offering a vast range of printing services, from business cards to vehicle graphics, ALXVCS will provide fast, high-quality printing services to bring the creative work of ALX Agency into the physical world. Visit www.alxvcs.com to see for yourself what is capable when concept + color are brought to life. Viaweb Inc. has been a division of ALX since the beginning, and are still in action to serve the website development needs of ALX Agency. Part of every good marketing campaign is a solid web presence, and the tech experts at Viaweb are constantly at work creating better, faster, and more accessible websites for ALX clients. Viaweb employs a strong team of developers who build user-friendly websites with the easy to learn WordPress CMS. Visit www.viawebinc.com to learn more about the hosting packages and web services available for your business. We would like to thank all of our friends and clients for supporting ALX, and giving us the opportunity to expand our business. We look forward to helping you do the same.